Like any business, you probably use a wide range of marketing materials in an attempt to spread your message far and wide. Even though you rely heavily on the print techniques that have worked so well in the past, you've probably also branched out into the wonderful world of social media and digital marketing. But one marketing opportunity remains largely untapped by many businesses. 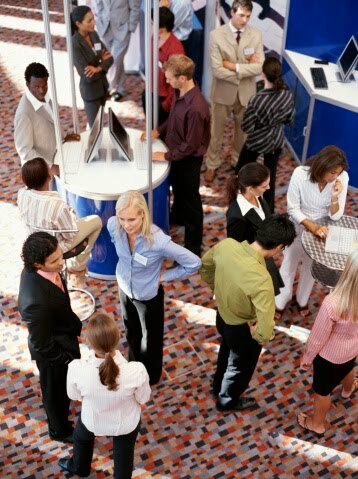 That opportunity is the trade show, which brings with it a wide range of opportunities you can't ignore. One challenge of any marketing campaign is grabbing the attention of your target audience. In a lot of cases, those who receive your mailers or who see your posts on social media aren't necessarily looking for your particular product or service at that time, which means you not only have to grab hold of their attention in a meaningful way, but you also need to do whatever it takes to maintain their attention until they are ready to buy. In contrast, a trade show is essentially the exact opposite situation. Trade shows, by their very nature, are designed to bring both consumers and businesses together in a venue where interaction is the name of the game. You don't have to struggle to grab their attention -- they've shown they're already willing to give it to you just by walking through the door. As a result, trade shows are excellent opportunities to create lasting impressions. If you want a clear-cut example of just how big an opportunity your next trade show is, look no further than the number of attendees. The Consumer Electronics Show in Las Vegas, for example, brings in over 150,000 people on an annual basis. Even niche shows like the San Diego Comic Book Convention, which is a bit of a mecca for all things entertainment and pop culture, draws over 100,000 people (and growing) annually. This represents a massive opportunity for generating leads you literally won't find anywhere else. Every single person who walks through the door is a potential lead just waiting to do business with somebody like you. Perhaps the most important benefit of trade shows, however, is one of equality. A company with $1,000,000 to spend on marketing materials and a company with only $1,000 to spend are essentially on completely equal ground. If you can make a solid presentation and have your booth staffed with helpful materials and the right employees, you'll attract visitors who will stop and hear what you have to say. From the lasting impressions they tend create to the face-to-face encounters you just won't find anywhere else, trade shows are truly an excellent opportunity to reach new customers. There are few better venues for finding like-minded individuals who are already interested in your particular industry. If you play your cards right, practice brand consistency, and put your best foot forward, you'll discover trade shows are an investment that can pay dividends for a lifetime.